1. Trim any excess fat from steak. Combine beer, lime juice and Worcestershire sauce. Place steak in a shallow pan and pour marinade over steak. Cover and refrigerate 6-8 hours, turning occasionally. 2. When ready to cook, drain off marinade. Place 2 tablespoons oil in a 12 inch nonstick skillet. Cook bell pepper and onion in oil, add steak and cook 6-8 minutes, turning once. Remove from heat and cut steak into 1/2 inch strips. 3. Serve on warm tortillas with salsa and guacamole. 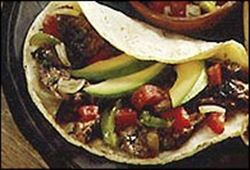 Enjoy this delicious beer fajitas Mexican recipe!